Secretariat of Kaduna State Correspondents’ Chapel of Nigeria Union of Journalists (NUJ) was in the wee hours of Monday 6th, 2017 gutted by fire. Eyewitnesses account revealed that, the incident started at about 1a.m, and destroyed most part of the secretariat. The cause of the fire remains unknown at the time of filling this report. The inferno burnt property worth millions of naira as well as some vital documents, yet to be quantified. However, Chairman of the chapel, Mr. Midat Joseph has urged members to remain calm and go about their normal jobs. Mr. Joseph said the police authorities have been informed of the incident, and urged members to wait for the outcome of police investigations. Meanwhile, the State Governor, Malam Nasir El-rufai, Senator Shehu Sani among others have commiserated with members of the chapel. 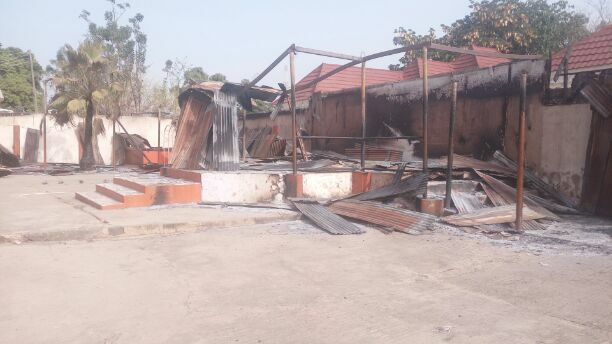 Speaking through his adviser on media and publicity, Samuel Aruwan, the governor promised to assist and ensure that the burnt secretariat is given the necessary facelift as soon as possible. Also, a sympathizer and founder of Sickle Cell Health Promotion Centre, Hajiya Badiya Magaji Inuwa commiserated with the chapel, even as she donated some amount of money to the secretariat.